Nestled in the back corner of an old ski shop with creaking wooden floors, underneath the recent acquisition of a box of bear skins, was a young Ron Lahout, eagerly waiting for the proper time to strike. Customers would come and go, drinking beer in the back, trying on jackets in the front, entirely unaware of the hiding toddler, only to have the wits scared out of them when they heard the inevitable growl come from the seemingly lifeless box of bear fur. Lahout Sr. on the balcony of the apartment in Littleton, New Hampshire where he was born in, and still lives today. Christopher Baldwinch Photo. 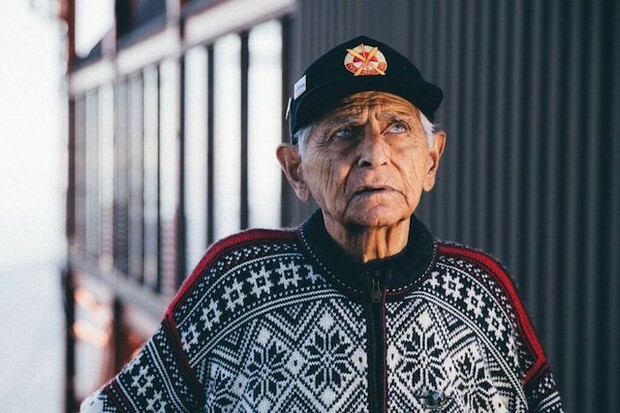 From toddlers to teenagers, Ron, Herb, Nina, and Joe Lahout Jr. had patrons for playmates, clothing racks for swing sets, and eventually the beer fridge as a bar–which was not entirely unlike their father's, the now 93-year-old Joe Lahout. In 1922, Mr. Lahout was brought into the world just as prohibition was settling into its prime. 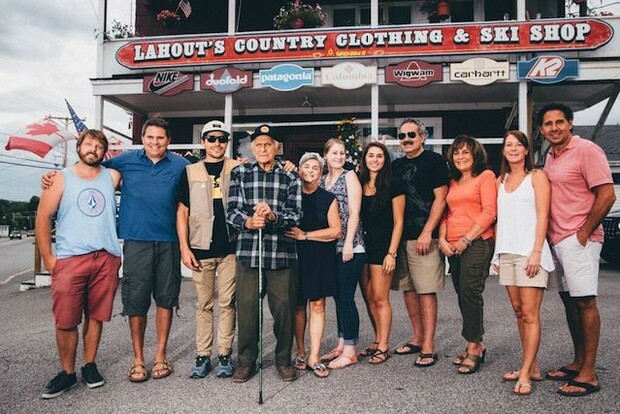 Born upstairs of the then Lahout's Country Clothing Store "a hundred years ago," Mr. Lahout has called the store, in Littleton, New Hampshire, his home for the entirety of his life, leaving only once, as all boys did back then, to serve in World War II. 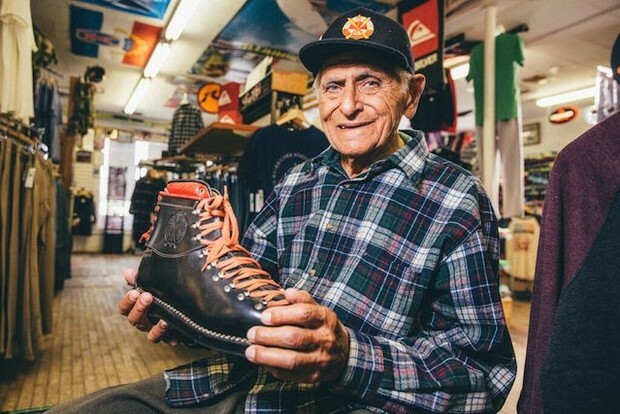 Nearly 94 years later, and just shy of the store's 100th Anniversary, Joe Lahout remains at the helm, and in the same apartment he was born in, upstairs of Lahout's Ski Shop, the oldest ski shop in America. Under his ambitious and determined parents, Mr. Lahout and his sisters assumed the position of the sales force, dedicating their time to running the store with their widowed mother. "I like to get out there and just do it" Joe Lahout Christopher Baldwinch photo. 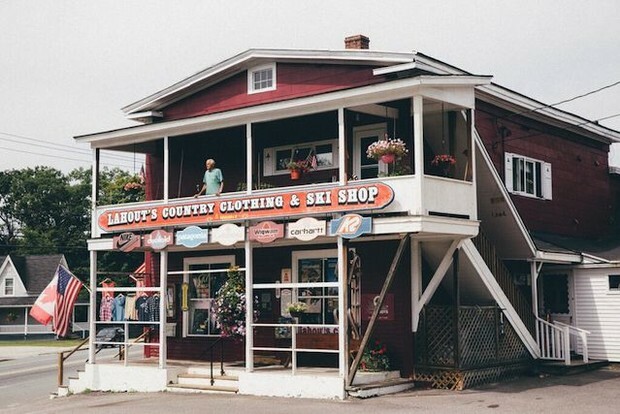 With the majority of his childhood spent on the floor, Lahout adopted skiing as the only way to enjoy the long, cold, dark winters of New Hampshire. Yet, the pastime he took to has little in common with the lift-accessed, Gore Tex-clad luxury sport of today, and more to do with the freedom and pleasure of a day on two planks. Geared with seven-foot 2x4's and leather boots, Lahout cut his teeth making the daily trek up the nearby Remich Park for a quick descent; often repeating it dozens of times to feel the speed underfoot, the wind in his hair, and the frost nip on his toes. 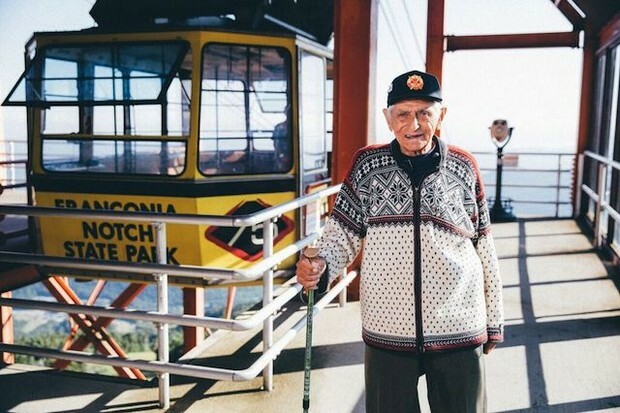 It wasn't until 1934 that a 12 year-old Lahout experienced a machine-powered ascent at Cannon Mountain, home of the first aerial tramway in North America. Following his stint serving in the War, Lahout returned to Cannon, "put the damn skis on, and went like hell. We skied, and we skied hard." 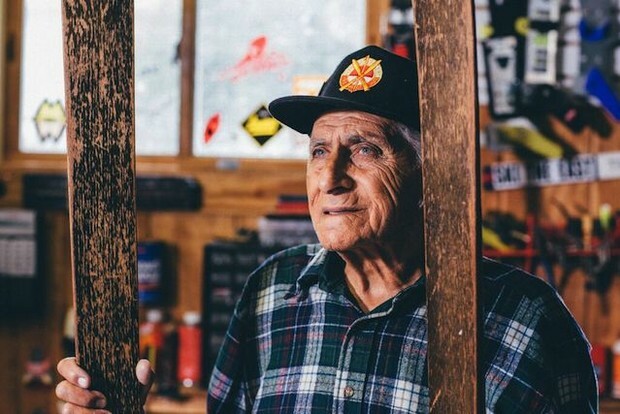 That dedication to hard work and hard skiing has waned little since his teenage years, and is undoubtedly reflected in the store's history. The original register sits in the store today, perhaps now unused. Christopher Baldwinch photo. Without the familiar convenience of unlimited resources, like telephones or registers that added numbers, Mr. Lahout made business deals on his sole indoor pay-phones, had regular customers bring in their own bags, and added numbers by pencil. This efficiency allowed for a low overhead with the ability to sell quality goods at extremely affordable prices. Lahout on the floor of the now legendary ski shop. Christopher Baldwinch photo. With beer and food sold in the back, and gas sold in the parking lot out front, Lahout was able to keep his customers entertained and fed, while selling them anything related to outdoor sports. Parents would bring their children, Lahout's kin would drag them to the back, either getting along splendidly as preteens do, munching on penny candy, or torturing and fighting each other as young children are prone to do. So rather than just a retail space, Lahout's was a family friendly, all-encompassing business, catering to the local dairy farmers and the weekend city warriors alike. But he didn't do it alone. Lahout has been riding that same tram since he was 12 years old. Christopher Baldwinch photo. To this day, grandchildren of customers past come in, yelling, "Where's Gladys?!" as they way through the door. Lahout's late sister, Gladys, would greet customers with an aggressively friendly kiss on the neck and a "Honey, how's your love life?" Gladys was “going to all of the après ski parties in Franconia, Mittersill, and Cannon. She was getting the word out. She was a real hustler." Oftentimes, selling jackets by pulling them taught in the back when a customer was examining the fit in a mirror, followed by a "Honey, how incredible do you look!" With a diligent Lahout on the books behind the business strategy and a socialite Gladys on the floor, this dynamic duo created an East Coast institution. The original skis were 7 foot wooden planks, like these ones. Christopher Baldwinch photo. And when it came time to retire to the upstairs quarters where he was born, there was no doubt that his mischievous children would claim the store as their own, walking those familiar creaky floors now as college graduates, businessmen, and fathers of sons and daughters, just as their own did. Ron, Herb, Nina, and Joe Jr. now cater to the third and fourth generation of Lahout's customers. Recognizing patrons as childhood acquaintances with friendships fostered in the store itself. Lahout and his brood outside the store that raised them. Christopher Baldwinch photo. With children older than I am, the sons now run 8 Lahout's stores, with a total of five children that still call the original location home. 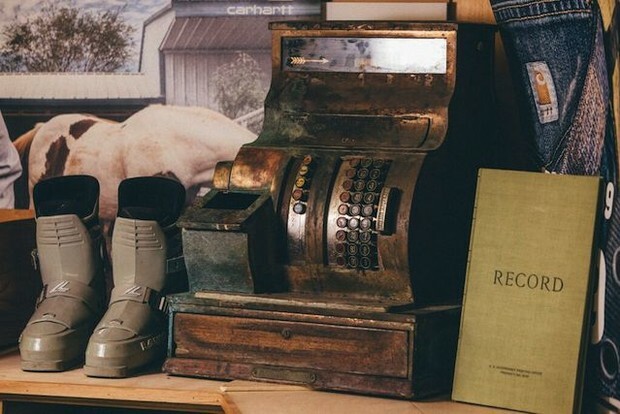 The family to this day congregates in the store, taking turns answering phones in the front and boot fitting in the back; the lines between moms and aunts, dads and uncles, and parents and grandparents blurred by the familiarity of a family raised by a village. Lahout and the store have seemingly grown side by side. Christopher Baldwinch photo. Nearing the store's 100th Anniversary, Mr. Lahout's 100th birthday, and lastly, his hometown hill, Mt. Eustis' reopening, the Lahout's name is here to stay, just as it has, for a second century. RELATED: Support Mt. Eustis' Reopening Here. All goods to help sustain and support Mt. Eustis are available here. 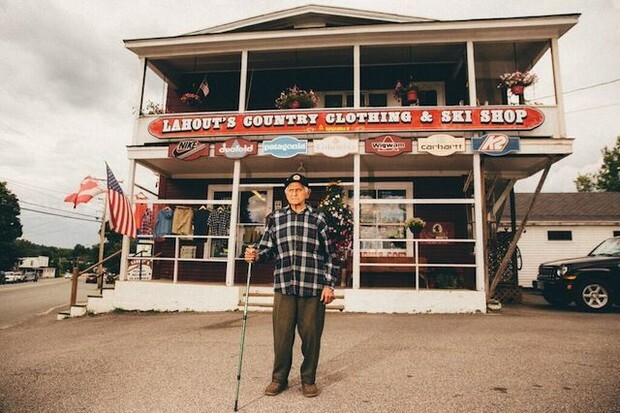 With this brood of a legacy and stores with his namesake, Mr. Lahout has unintentionally established himself as the Grandfather of East Coast Skiing, the accidental legend raised by the house that skiing built; Lahout's Ski Shop. This was fantastic. Getting to visit this ski shop during a drywall repair was one of the best things I’ve ever done.